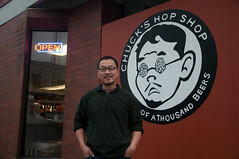 It’s safe to say that Chuck’s Hop Shop in the Central District was a hit right off the bat. From day one, business has been robust, and it’s rare that I go in there and the place isn’t packed. Much like the original location in Greenwood, the neighborhood has embraced the business. It’s the unique place that can serve as a hangout for all types, from uber beer geeks to parents with their kids in tow. This Saturday, Chuck’s will celebrate their 2nd Anniversary at the Central District location by filling 30 of their taps with some very special beers (list below). The beers will be on tap when they open the shop at 11am. It will be busy, but they do a great job of cycling through long lines quickly there. Block 15 Brewing, an outstanding brewery from Corvallis, OR, also brewed Chuck’s a special 2nd Anniversary IPA that is packed with Galaxy hops. It will be available on draft and in 4-packs of 16oz cans. There will be plenty of other great beers to round out the list, I’m sure. Still have your glass from another Chuck’s event?! Bring it with you to our Anniversary to avoid being sold another!! We’ll be using the same format as this summer’s Sour Fest! When you arrive you’ll pay $10 for a glass, and 9 taster tickets. Additional tickets can be purchased at the door, or later at the bar. 4 ounce draft pours will range between 1-4 tickets. Tickets can be used for gratuity. We’ll buy back any unused tickets should you need to make a quick exit. In addition to the special drafts, they have been saving up a case of every Holy Mountain Brewing bottle release that has seen distribution, and they are going to put those out for sale at 11am as well. That includes The Hart, The Ox, Misère au Borinage, The Seer and The Goat. Last year most of our taps lasted well into the evening. If you’re not chasing the uber-rare beers, come by in the afternoon or evening! It’ll be much calmer, and we’ll still have some wonderful beers pouring! Per the event page on Facebook, they’ll have to cut 3 beers from this list to get down to 30 taps.